Was what International Women's Day was originally called. It originated, as did May Day, in the United States. It was a union and socialist holiday recognizing women workers rights to organize unions, a struggle that still is with us today as the battle in Wisconsin shows. American Socialists organised a mass meeting on the suffrage in New York on Sunday 8 March 1908. The first National Woman’s Day (woman’s in the singular) was held on 23 Feb 1909 in the USA, and American women kept the custom of gathering on the last Sunday of February. Sundays were preferred so that people would not miss a day of work. Rosalind Rosenberg, a professor of history at New York's Barnard College, says the holiday was created as the country's workers, including large numbers of women, were losing patience with poor labor conditions. Early American women's activist Rose Schneiderman speaks at a union rally around 1910. "I would date it back to 1908 and the strike of some 15,000 women in the garment industry on the Lower East Side who were suffering low pay and terrible working conditions, and who walked off the job and protested," Rosenberg says. Among their complaints was the fact that employers refused to recognize workers' unions. "Unionization is such an enormous issue in the United States today," Rosenberg says. "It's poignant to think about this 100th anniversary in that context." It was the International proletariat organizations in Europe that responded to the call from workers organizations in the United States to celebrate both events. And both are based on tragedy, May Day the Haymarket Massacre and IWD the Triangle Shirtwaist Factory Fire. Indeed the struggle of women workers in America would continue with the great Patterson Mill Strike of 1913. And while American workers, both women and men, have made great leaps forward as has American Capitalism, class war has been declared once again on workers rights to organize. The International Ladies' Garment Workers Union organized workers in the women's clothing trade. Many of the garment workers before 1911 were unorganized, partly because they were young immigrant women intimidated by the alien surroundings. Others were more daring, though. All were ripe for action against the poor working conditions. In 1909, an incident at the Triangle Factory sparked a spontaneous walkout of its 400 employees. The Women's Trade Union League, a progressive association of middle class white women, helped the young women workers picket and fence off thugs and police provocation. At a historic meeting at Cooper Union, thousands of garment workers from all over the city followed young Clara Lemlich's call for a general strike. Women's labour unrest continued in the U.S. through 1909, with the International Ladies' Garment Workers' Union staging a short-lived strike in September in New York City. On Nov. 22, a general strike was called, dubbed the Uprising of the Twenty Thousand, which lasted 13 weeks and eventually led to a fairer contract for 15,000 labourers. In Europe, women's issues were also top of mind. In 1907, the first meeting of Finnish parliament included 19 women. In 1910, an International Conference of Working Women was held in Copenhagen, featuring representation from 17 countries, including union leaders and the Finnish parliamentarians. 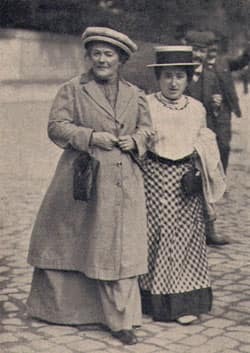 Clara Zetkin, head of the women's office for the Social Democratic Party of Germany, first raised the idea of an annual women's day when women all over the world would be able to air their grievances about labour conditions, suffrage and the need for women in parliament. The first International Women's Day was held on March 19, 1911, (moved to March 8 in 1913), with rallies in Germany, Denmark, Austria and Switzerland. More than one million women and men attended. One week later, a devastating fire at the Triangle Shirtwaist Factory in New York City drew further attention to the horrible working conditions female workers, mostly immigrants, were forced to endure. 275 girls started to collect their belongings as they were leaving work at 4:45 PM on Saturday. Within twenty minutes some of girls' charred bodies were lined up along the East Side of Greene Street. Those girls who flung themselves from the ninth floor were merely covered with tarpaulins where they hit the concrete. The Bellevue morgue was overrun with bodies and a makeshift morgue was set up on the adjoining pier on the East River. Hundred's of parents and family members came to identify their lost loved ones. 146 employees of the Triangle Shirtwaist Company were dead the night of March 25, 1911. The horror of their deaths led to numerous changes in occupational safety standards that currently ensure the safety of workers today. did. And yet, when one interrogates the obvious, one encounters the problematic. incandescent icon for so many? Striking laborers rallied against unfair labor practices with two of the most publicized strikes occuring in 1910: The garment workers in New York City and the strike that took place at the Los Angeles Times. However, one labor union strike would significantly define the labor movement: the Patterson Strike of 1913. To understand the pros and cons of striking unions, it's necessary to recall that few federal or state laws had been enacted at that time to protect workers from unsafe working conditions or from exploitation through which laborers earned unimaginably low wages while working fourteen or fifteen hours a day. When IWW organizers began to arrive at textile mills to proclaim the doctrine of industrial democracy, a substantial number of workers were interested. By 1908, after leading a number of minor strikes, the IWW could claim 5,000 members for its National Industrial Union of Textile Workers headed by James P, Thompson. The biggest textile challenge came four years later when pay cuts led to a groundswell of strike sentiment in Lawrence, Massachusetts. IWW Local 20 had been on the scene for more than four years, and its members had an excellent grasp of the conditions of the 60,000 Lawrence residents dependent on the mills for their livelihood. Prompted by local IWWs, the strikers sent for seasoned organizer Joe Ettor, an IWW orator who had already been in Lawrence, and Arturo Giovannitti, Secretary of the Italian Socialist Federation and editor of its organ, Il Proletario. Faced with having to organize workers from twenty-four major national groups speaking twenty-two different languages, the Lawrence leadership devised an organizational structure that became the standard IWW mode of operation. Each language group was given representatives on the strike committee, which numbered from 250 to 300 members. All decisions regarding tactics and settlements were democratically voted on by the committee, with the IWW organizers acting strictly as advisors. The Lawrence strikers realized that their battle went beyond wages and work conditions to address the question of the quality and purpose of life. Female strikers expressed their needs in an unforgettable phrase when they appeared on the picket line with a homemade placard declaring, "We Want Bread and Roses Too," a demand which became a fixture in the labor and ferninist movements. But neither roses nor bread were possible without the most militant kind of strike and innovative worker tactics. Women would show the way on both scores. More female pickets than males were to be arrested for intimidating strikebreakers, and rank and file women provided decisive leadership at key moments in the strike. Prohibited from massing before individual mills by law, the male and female strikers formed a moving picket line around the entire mill district! This human chain involving thousands of spirited workers moved twenty-four hours a day for the entire duration of the ten-week strike. Augmenting the awesome picket lines were frequent parades through town of from 3,000 to 6,000 strikers marching to militant labor songs. When a city ordinance was passed forbidding parades and mass meetings, the strikers improvised sidewalk parades in which twenty to fifty individuals locked arms and swept through the streets. They passed through department stores disrupting normal business and otherwise succeeded in bringing commerce to a halt. At night strikers serenaded the homes of scabs trying to get a good night's sleep, and in some cases the names of scabs were sent back to their native lands to shame their entire clan. When striker Annie Lo Pezzo was killed during one of the demonstrations, Ettor and Giovannitti were arrested on murder charges; they were said to have provoked workers to illegal acts which in turn resulted in the death. Their places were promptly taken by Bill Haywood, Elizabeth Gurley Flynn, William Trautman, and Carlo Resca. Haywood's arrival in Lawrence was tumultuous. Fifteen thousand strikers greeted him at the railroad station and 25,000 listened to him speak on the Lawrence Commons. During the course of the strike, there were dynamite schemes by employers, a proclamation of martial law, the death of a Syrian teenage boy from a militiaman's bayonet, and repeated physical confrontations between strikers and law enforcement groups. Women again played a critical role when it was decided to have the children of the strikers cared for by sympathizers in other cities. After some groups of children had left Lawrence, the army resolved to block further removals. In the ensuing physical confrontation, many women were beaten and two pregnant women miscarried, The brutal incident led to the national publicity and governmental hearings that resulted in victory for the strikers. In the wake of the Lawrence triumph came strikes in other textile centers under IWW leadership and a successful campaign to free Ettor and Giovannitti. Prominent women such as socialist humanitarian Helen Keller, birth control activist Margaret Sanger and AFL organizer Mary Kenney O'Sullivan enthusiastically supported various IWW initiatives. Textile owners not yet faced with strikes began to grant wage increases unilaterally in hopes of averting unionization. The Detroit News estimated that 438,000 textile workers received nearly fifteen million dollars in raises as an indirect consequence of the Lawrence strike, with the biggest gains scored by the 275,000 workers in New England.